Maternal low-protein (LP) diet during gestation results in a reduced beta cell mass in the offspring at birth and this may hamper the ability to adapt to high-energy food and sedentary lifestyle later in life. To investigate the biology behind the LP-offspring phenotype, this study aimed to identify differentially expressed genes in the pancreas and their potential role in the fetal programming. Wistar rats were given either an LP diet or normal-chow (NC) diet during gestation and differentially expressed genes in the offspring around the time of birth were identified using RNA microarray and quantitative PCR. The role of a differentially expressed gene, growth arrest specific protein 6 (GAS6), was evaluated in vitro using neonatal rat islets. The mRNA level of Gas6, known to be mitogenic in other tissues, was reduced in LP offspring. The mRNA content of Mafa was increased in LP offspring suggesting an early maturation of beta cells. When applied in vitro, GAS6 increased proliferation of neonatal pancreatic beta cells, while reducing glucose-stimulated insulin secretion without changing the total insulin content of the islets. In addition, GAS6 decreased the mRNA content of Mafa. We propose a role for GAS6 in the regulation of pancreatic beta cells in the critical period around the time of birth. Our results support the hypothesis that the reduced beta cell mass seen in LP offspring is caused by a change in the intra-uterine environment that favours premature maturation of the beta cells. The online version of this article (doi: 10.1007/s00125-012-2821-9) contains peer-reviewed but unedited supplementary material, which is available to authorised users. Maternal malnutrition during gestation, such as a low-protein (LP) diet, affects the intra-uterine environment and changes the programming of the fetus. This gives rise to an altered capacity to meet metabolic challenges later in life, when exposed to high-energy food and sedentary lifestyle, with an increased risk of developing metabolic diseases such as type 2 diabetes mellitus as a consequence. Accordingly, a correlation between a low birthweight and later development of insulin resistance and impaired glucose homeostasis is evident in humans as well as in animal studies [1, 2, 3, 4, 5]. The thrifty phenotype hypothesis suggests that the inadequate nutritional status of the fetus impairs the development of the endocrine pancreas with a reduced beta cell mass at birth as a consequence . 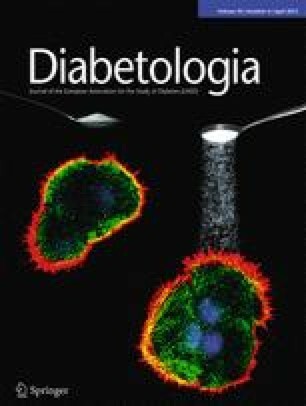 Indeed, human autopsy studies have shown that impaired synthesis and secretion of insulin in type 2 diabetes mellitus is associated with a reduced beta cell mass . At the time around birth a dramatic increase in beta cell mass occurs [7, 8]. The expansion arises from the proliferation of existing beta cells and by neogenesis from progenitor cells and declines after birth [9, 10]. A maternal LP-diet diminishes proliferation of the fetal beta cells around the time of birth [11, 12], and this could partly be caused by premature maturation at the expense of proliferation, thus giving rise to a reduced total beta cell mass . Diet-induced changes in the temporal expression of transcription factors important for beta cell differentiation and maturation, such as v-maf musculoaponeurotic fibrosarcoma oncogene (MAF) homologue A and B and pancreatic duodenal homeobox-1 (PDX1), very likely play a role in development of the phenotype of LP offspring [14, 15, 16]. The regulation of these factors is, however, not fully clarified. Identification of factors regulating this process would give a clue to the treatment or prevention of the adverse effects of fetal programming of beta cells. Growth arrest specific protein 6 (GAS6) is a vitamin K-dependent ligand for the AXL receptor tyrosine kinase subfamily . It is secreted by endothelial cells and has been reported to have mitogenic and anti-apoptotic effects on several cell types, such as NIH 3T3 fibroblasts, cardiac fibroblasts and hepatic cells [18, 19, 20] and to play a role in liver regeneration . Gas6 mRNA is present in the pancreas  and synthesised by alpha cells of the islets of Langerhans . A recent study reported an association between high plasma GAS6 concentrations and a decreased risk of developing of type 2 diabetes mellitus . Additionally, a transgenic mouse strain possessing a constitutive active AXL receptor throughout cells of the myeloid haematopoietic linage, showed a non-insulin dependent diabetes mellitus phenotype with gradual age-dependent reduction in the number of insulin-positive cells, possibly due to sequestering of free GAS6–ligand present in plasma . However, the possible role of GAS6 in regulation of beta cell mass or whether any receptors for GAS6 are present in beta cells has never been investigated. The aim of this study was to investigate the role of GAS6 in regulation of proliferation, cell survival and functional capacity of pancreatic beta cells in isolated islets of Langerhans. Experiments in this study were in accordance with the regulations of the Danish Animal Experimental Inspectorate. Animals were purchased from Taconic (Ry, Denmark). Twenty-four Wistar rats (10–11 weeks old) were time-mated and transferred to local facilities. Twelve rats were assigned one of two isocaloric diets: LP (8% casein; Hope Farms 4400.00, Woerden, Netherlands) or NC (20% casein; Hope Farms 4400.01) (Table 1). Rats were pair-fed and allowed free access to water and kept under a 12 h light/12 h dark cycle until killed. Time-mated females were killed 2 days before giving birth (E20), immediately after giving birth (P0) or 2 days after giving birth (P2); offspring were decapitated and pancreases removed and placed directly in cold TRI Reagent (Sigma-Aldrich, St Louis, MO, USA) for RNA extraction. Rats used for islet isolation were transferred to local facilities 1 day before the start of the experiments, kept under a 12 h light/12 h dark cycle until killed and allowed free access to food and water. Neonatal rat islets were isolated from pancreases of 4-day-old Wistar rat pups . Pups were killed by decapitation and pancreases were dissected and placed in ice-cold serum-free Hanks’ balanced salt solution (HBSS; Lonza, Verviers, Belgium). Pancreases were distributed into tubes, and partially dissociated by use of collagenase (Roche, Penzberg, Germany) at a final concentration of 1.5 mg/ml. Islets were isolated by use of Histopaque (1.077 g/ml density) (Sigma, St Louis, MO, USA) for 20 min at 1,400g without brake. Islets were collected from the interface, washed with ice-cold HBSS containing 10% FBS (Biosera, Ringmer, UK) and handpicked under a dissecting microscope. Adult rat islets were isolated from 12-week-old male Wistar rats. Rats were killed and the pancreas was injected with Liberase TL Research Grade (Roche, Penzberg, Germany) at a final concentration of 0.2 mg/ml via the common bile duct. The pancreas was removed following injection of 6.5 ml Liberase solution and incubated at 37°C for 21 min. The suspension was passed through a metal filter (pore size 425 μm) and washed with cold HBSS containing 10% FBS. Subsequently the islets were handpicked. Rat islets were resuspended in RPMI 1640 with l-glutamine and 11 mmol/l glucose (Lonza) with 10% FBS, 100 U/ml penicillin and 100 U/ml streptomycin (Lonza), plated in bacteriological Petri dishes (Nunc, Roskilde, Denmark) and cultured at 37°C and 5% CO2. Human islets were provided through the JDRF Islet Distribution Program, which has been approved by central and local ethical committees. Islets were resuspended in RPMI 1640 (Lonza) with 5.6 mmol/l glucose, 10% FBS, 100 U/ml penicillin and 100 U/ml streptomycin, plated in bacteriological Petri dishes and cultured at 37°C and 5% CO2. Microarray analysis was performed on whole pancreases from rat pups dissected out at three time points around birth for transcriptional profiling. Biotin-labelled cDNA was synthesised from 1 μg perinatal pancreas total RNA according to the Affymetrix protocol (Affymetrix, Santa Clara, CA, USA) and hybridised to Rat Genome 230 2.0 Array. Hybridisations and scanning were performed at Rigshospitalet Microarray Center (Copenhagen, Denmark). The statistical software package R v. 2.9.1 (http://www.r-project.org/) and Bioconductor v. 2.5 (http://www.bioconductor.org/) was used to localise differentially expressed genes. RNA from pancreas or isolated islets was extracted with TRI Reagent (Sigma-Aldrich) according to the manufacturer’s instructions. The RNA content in the samples was measured on a NanoDrop ND1000 spectrophotometer (Nanodrop Technologies, Wilmington, DE, USA). cDNA was prepared by reverse transcription of RNA by use of qScript cDNA SuperMix (Quanta, Gaitherburg, MD, USA). A volume of each sample corresponding to 1 μg RNA was used. Quantitative real-time PCR (qPCR) was performed on 10× diluted cDNA on Stratagene Mx 3000P (AH diagnostics, Aarhus, Denmark) using LightCycler FastStart DNA MasterPLUSSYBR Green I reaction mix (Roche, Mannheim, Germany). Samples were loaded in triplicates. Primers used in this study are given in electronic supplementary materials (ESM) Table 1. For the in vitro studies with GAS6 for qPCR, islets were cultured for 48 h in RPMI 1640 (with l-glutamine and 11 mmol/l glucose) with 0.05% human serum albumin (HSA) (Sigma), 100 U/ml penicillin and 100 U/ml streptomycin treated with or without GAS6 (300 ng/ml) (catalogue No. 885-GS; R&D Systems, Minneapolis, MN, USA). Islets were cultured for 96 h in RPMI 1640 (with l-glutamine and 11 mmol/l glucose) with 0.05% HSA, 100 U/ml penicillin and 100 U/ml streptomycin treated with or without GAS6 (300 ng/ml). For assessment of insulin secretion 30 islets/condition were pre-incubated for 90 min in Krebs–Ringer HEPES buffer (KRHB) supplemented with 2 mmol/l glucose in suspension culture plates (Sarstedt, Nümbrecht, Germany). Subsequently, the islets were transferred to fresh KRHB (2 mmol/l glucose), incubated for 30 min and then transferred to KRHB (20 mmol/l glucose) and incubated for 30 min. The KRHB was collected for insulin measurements. After GSIS experiments islets were re-collected, lysed (sonication: 40 W for 2 × 15 s) and saved for determination of insulin and DNA content. Insulin levels in KRHB samples and total insulin content was determined by competitive ELISA using rat insulin as standard. The first antibody was rabbit polyclonal secondary antibody to guinea pig IgG, IgM and IgA (ab8522; Abcam, Cambridge, UK) and the second antibody was guinea pig anti-insulin (Novo Nordisk, Bagsværd, Denmark). The total DNA content in the islets was determined using Quant-iT PicoGreen dsDNA Kit (Invitrogen, Paisley, UK) according to the manufacturer’s instructions. Proliferation was quantified by 5-ethynyl-2′-deoxyuridine (EdU) incorporation in islets. Islets were cultured for 72 h in RPMI 1640 (with l-glutamine and 11 mmol/l glucose) containing 2% human serum (Lonza) in extracellular matrix-coated culture plates (Biological Industries, Kibbutz Beit Haemek, Israel). Islet were then cultured for 96 h in RPMI 1640 (with l-glutamine and 11 mmol/l glucose) with 0.05% HSA, 100 U/ml penicillin and 100 U/ml streptomycin treated with either GAS6 (300 ng/ml) or human growth hormone (Novo Nordisk; hGH, 400 ng/ml) as a positive control. After 72 h of incubation EdU (Click-iT EdU imaging Kit; Invitrogen) was added (10 μmol/l) for 24 h. The cultures were fixed in 4% formaldehyde and stained for PDX1 (BCBC antibody core, ab2027; Novo Nordisk) with Cy3-conjugated donkey anti-goat IgG as secondary antibody (705-166-147; Jackson Immunoresearch Laboratory, Suffolk, UK), for EdU and with Hoechst dye. Slides were assigned random numbers and counted blindly. Proliferation of beta cells was determined by counting one section (2D) from five islets per condition (approximately 800–1,800 cells) and calculating the fraction of cells positive for EdU (PDX1+ cells were counted using image J software (http://rsbweb.nih.gov/ij/); EdU+PDX1+ cells were counted manually) using a Zeiss LSM 710 Axio Imager confocal microscope (Zeiss, Jena, Germany). Apoptosis was measured by Cell Death Detection ELISAPLUSkit (Roche, Indianapolis, IN, USA) according to the manufacturer’s instructions. Islets were cultured for 24 h in RPMI 1640 (with l-glutamine and 11 mmol/l glucose) with 0.05% HSA, 100 U/ml penicillin and 100 U/ml streptomycin treated with GAS6 (300 ng/ml). After 24 h, cytokines (recombinant mouse IL-1β [BD Pharmingen, San Diego, CA, USA] 150 pg/ml, rat IFN-γ [R&D Systems] 0.1 ng/ml) or palmitate (1 mmol/l) was added for 24 h. After a total of 48 h, apoptosis in cell lysates was measured by examination of the presence of cytoplasmic histone-associated DNA fragments. Perinatal and adult Wistar rat pancreases were fixed in 4% paraformaldehyde, and stored at +4°C for 2 weeks. Next, pancreases were embedded in paraffin overnight and sliced into sections of 4 μm and arranged on slides. Neonatal pancreases were cut in longitudinal slices and adult pancreas (caudal part) was cut in transverse slices. Sections were deparaffinised in xylene and hydrated with decreasing ethanol solutions in water. Specimens were stained using monoclonal rabbit anti-AXL IgG (LS-B7213; Life Span Biosciences, Seattle, WA, USA) and monoclonal mouse anti-insulin IgG (ABM 816; Nordic Biosite, Copenhagen, Denmark) as primary antibodies and Alexa fluor 488 goat anti-rabbit (A11034; Invitrogen) and Alexa fluor 594 goat anti-mouse (A11005; Invitrogen) or goat peroxidase-conjugated anti-mouse (P0447; Dako, Glostrup, Denmark) as secondary antibodies, respectively. For fluorescence microscopy, specimens were mounted with Prolong Gold Antifade mounting media with DAPI (Invitrogen) and investigated with an Olympus BX43 fluorescence microscope (Olympus, Tokyo, Japan). Identical settings of the microscope were used when addressing stainings in neonatal and adult pancreas. Two 4-μm-thick longitudinal slices (> 100 μm distance) per neonatal rat pancreas (one to three pancreases per litter) were stained for insulin and counter-stained with haematoxylin and eosin. Using a ×10 objective, pancreas sections were investigated with an Olympus BX43 microscope (Olympus, Tokyo, Japan), and five images/slice (covering 3.80 ± 0.16 mm2 pancreas) were sampled. Slides were assigned random numbers and measured blindly. The islet area of total exocrine area (total area–total islet area) was measured with ImageJ software. Results are given as mean ± SEM. mRNA levels in the LP study and effect of GAS6 on apoptosis was tested by a two-way ANOVA test. When a main effect was detected, a Student–Newman–Keuls post hoc test was performed to localise significant differences. The effects of the LP diet on offspring birthweight and size of the endocrine pancreas were tested by a one-tailed non-paired Student’s t test. The effects of GAS6 on mRNA, protein content and proliferation were tested by a two-tailed non-paired Student’s t test. The effect of GAS6 on insulin secretion was tested by a two-way repeated measurement ANOVA test. When a main effect was detected, a Holm–Sidak post hoc test was performed to localise significant differences. The significance level used is p < 0.05. Offspring from mothers fed an LP diet during gestation weighed 15% less (p < 0.05) at birth and tended (p = 0.065) to have 21% less pancreatic endocrine tissue relative to exocrine tissue than offspring from NC mothers (Fig. 1a, b) in accordance with data from previous studies [12, 13]. The microarray analysis of the transcriptome from rat pup pancreases revealed several genes as being differentially expressed. Results from the microarray study will be described in detail elsewhere (M. Rasmussen, L. W. Gaarn, T. N. Haase, J. H. Nielsen, unpublished results). The expression of selected genes was investigated by qPCR (Fig. 1c–f). Gas6 mRNA content was reduced 63–75% (p < 0.05) at all time points in offspring from LP mothers compared with offspring from NC mothers. Axl mRNA content was increased four- to eightfold (p < 0.05) at all time points in offspring from LP mothers. Mafa mRNA content was increased 21-fold (p < 0.05) at E20, threefold (p < 0.05) at P0 and 65% (p < 0.05) at P2 in offspring from LP mothers. The insulin mRNA content was reduced 40% (p < 0.05) at E20, 60% (p < 0.05) at P0 and was similar at P2 in offspring from LP mothers. To investigate the effect of GAS6 on neonatal rat beta cells, isolated islets were cultured with recombinant GAS6 and the effects on GSIS, mRNA content, proliferation and apoptosis was examined. The basal level of insulin secretion in response to 2 mmol/l glucose was similar in neonatal rat islets cultured with or without GAS6 (Fig. 2a). When stimulated with 20 mmol/l glucose islets cultured with or without GAS6 increased their level of insulin secretion tenfold and ninefold, respectively. However, the amount of insulin secreted in response to 20 mmol/l glucose by islets cultured with GAS6 was 25% lower (p < 0.05) than by the amount secreted by islets cultured without GAS6. The total insulin content of islets was not affected by GAS6 (Fig. 2b). mRNA content was 70% reduced (p < 0.05) in islets cultured with GAS6 as compared with control (Fig. 3a). The mRNA content of Axl was also 70% reduced (p < 0.05) in islets cultured with GAS6 (Fig. 3b). There was no effect of GAS6 on the mRNA content of Pdx1 or insulin (Fig. 3c, d) or Mafb, Ngn3 (also known as Neurog3) and Gas6 (data not shown). Neonatal rat beta cells (PDX1+ cells) cultured with GAS6 increased their incorporation of EdU 30% (p < 0.05) compared with control (Fig. 4). hGH increased the proliferation of beta cells ∼105% (p < 0.05) compared with control. In response to IL-1 and IFN-γ the level of apoptosis increased 2.5- to threefold in control and GAS6-treated neonatal rat islets (Fig. 5a). Palmitate increased the level of apoptosis 2.5-fold in both treatment groups (Fig. 5b). GAS6 did not affect the cytokine or palmitate-induced level of apoptosis. To determine whether the identified effects of GAS6 in vitro on rat islets was age dependent, similar experiments were conducted on islets isolated from adult rats. The basal insulin secretion in response to 2 mmol/l glucose was similar in adult rat islets cultured with or without GAS6 (Fig. 6a). Increasing the glucose concentration to 20 mmol/l glucose induced a 16-fold increase in insulin secretion in both control and GAS6-treated islets. There was no difference in insulin secretion between control and GAS6-treated islets at either 2 mmol/l or 20 mmol/l glucose. The total insulin content of the islets was not affected by GAS6 (Fig. 6b). Neither Mafa nor Axl mRNA content in adult rat islets was affected by GAS6 (Fig. 6c, d). Adult rat beta cells cultured with GAS6 showed no statistically significant increase in proliferation compared with control (Fig. 7). hGH increased proliferation of beta cells fourfold (p < 0.05) compared with control. To investigate whether the AXL receptor tyrosine kinase is expressed in beta cells, histological sections of neonatal and adult rat pancreas were immunohistochemically stained. Numerous beta cells (insulin+ cells) in the islets of Langerhans were positive for AXL in the neonatal pancreas (Fig. 8a). A weaker presence of AXL was seen in cells of the exocrine tissue. In accordance with this, the level of Axl mRNA in neonatal islets constituted 32% of the total pancreatic content of Axl mRNA (Fig. 8b) (when the endocrine pancreas was estimated to cover 5.85% of the total pancreas, i.e. Fig. 1b). Alpha cells (glucagon+ cells) also expressed AXL (data not shown). In adult pancreas some beta cells were positive for AXL. The presence of AXL in the exocrine tissue was scarce compared to the neonatal pancreas. The majority of alpha cells in adult rat pancreas stained positive for AXL (data not shown). The mRNA content of Axl was 55% lower (p<0.05) in adult vs neonatal islets (Fig. 8c). The specificity of the AXL antibody was confirmed by the use of western blotting (see ESM Methods) and cortical neurons (negative control) (ESM Fig. 1). Islets from five different human donors (Table 2) were included in the study to identify possible species similarities/differences considering the effects of GAS6. Insulin secretion increased approximately fourfold when human islets where stimulated with 20 mmol/l glucose compared with 2 mmol/l glucose (Fig. 9a). There was no difference in GSIS between islets cultured with or without GAS6. GAS6 did not change the total insulin content of the islets (Fig. 9b). The level of beta cell proliferation in human donors was low compared with rat beta cells (Table 3, Figs 4, 7). GAS6 seemed to increase the proliferation of human beta cells in most donors, but this change was not statistically significant. hGH did not affect the proliferation of human beta cells. The time around birth is a critical window, where the beta cell mass expands and matures. Maternal malnutrition (e.g. resulting from an LP diet) can affect the outcome of this crucial period in the offspring. Here we report for the first time that GAS6 affects the proliferation and functional capacity of the perinatal beta cell. Our data reveals that Gas6, known for its mitogenic potential [19, 27], is expressed at a lower level in rat pancreases from LP offspring compared with offspring from mothers fed a normal diet. Simultaneously, a maternal LP diet increases the pancreatic mRNA content of Mafa. Interestingly, the in vitro studies in isolated islets presented here show a mitogenic effect of GAS6 on neonatal rat beta cells. This is accompanied by a negative effect of GAS6 on GSIS, which could be caused by the reduction of Mafa mRNA levels in GAS6-treated neonatal rats islets. This suggests that GAS6 could be involved in perinatal regulation of the beta cell mass by stimulating proliferation of beta cells and inhibiting functional maturation. MAFA is a master regulator of genes implicated in beta cell function, including proinsulin processing (prohormone convertase 1/3) in INS1 cells , glucose sensing (Slc2a2), vesicle maturation (Slc30a8), Ca2+ signalling (Camk2b) and insulin secretion (Nnat) [14, 29]. Accordingly, Mafa overexpression enhances GSIS in neonatal rat beta cells . In addition, MAFA induces insulin expression via binding to the insulin promoter ; however, total insulin content in beta cells was not affected in Mafa-deficient (−/−) mice , similar to the findings of the current study. In the perinatal period, a transition from Mafb to Mafa accompanies differentiation of beta cells in a temporal way, where Mafb expression is gradually reduced as Mafa expression increases so that mature beta cells only express Mafa [10, 16]. Interestingly, a recent study showed that Mafb was re-expressed in proliferative beta cells . Despite the GAS6-induced reduction in Mafa observed in this study, the Mafb mRNA content in GAS6-treated neonatal rat islets was unchanged. It was recently reported that a maternal LP diet increases the levels of factors in offspring associated with mature beta cells (among others Slc2a2; a target of MAFA) . Rodriguez-Trejo et al  suggested that the maternal LP diet changed the uterine environment to favour maturation of beta cells at the expense of proliferation. This hypothesis is supported by our finding of increased Mafa mRNA levels in LP offspring, and a similar insulin mRNA content 2 days after birth despite the reduced beta cell mass in maternal-LP-diet offspring [5, 13]. This study did not detect an anti-apoptotic effect of GAS6 on beta cells, in contrast to findings from studies using other cell types [18, 20]. GAS6 is a ligand for the AXL subfamily of receptor tyrosine kinases, comprising AXL, SKY and MER, with the highest affinity for AXL . Here we show that AXL is expressed by pancreatic beta cells in rats. Interestingly, AXL was more prominent in neonatal beta cells than in adult beta cells, suggesting age-dependent differences in the level of expression of this receptor. The data presented here show that the effect of GAS6 is age dependent in rats. The reason for this could be the age-dependent difference in the expression of Axl and perhaps other GAS6 receptors. This is supported by the unchanged Mafa mRNA levels seen in GAS6-treated adult rat islets, suggesting that the reason for the absent response to GAS6 in adult rat islets lies upstream of MAFA. The lack of a negative feedback of GAS6 on the Axl mRNA content in adult rat islets could also be caused by lower expression of Axl. Further studies are needed to clarify this. Adult rat islets are less responsive to mitogenic stimuli than neonatal rat islets. This is partly due to high production levels of factors associated with beta cell differentiation and inhibition of proliferation such as MAFA and P27 [8, 10]. Thus, the lack of GAS6 effects in adult rat beta cells could be due to the abundance of such factors. Alternatively, a paracrine effect of endogen GAS6 in adult rat islets, from islet cells such as alpha cells, could blunt the effect of supplementary GAS6 . It would be of great interest to investigate the effect of GAS6 in late fetal pancreas. One could speculate that GAS6 would have an even greater mitogenic effect on fetal beta cells due to the latter’s immaturity. The cell signalling pathways involved in the effects of GAS6 on neonatal rat beta cells and whether these function via AXL remain elusive. However, GAS6-induced AXL signalling in other cell types (e.g. NIH3T3 fibroblasts and 3D3 cells) is known to encompass the PI3K/AKT, PLC, Ras-regulated kinase (ERK) pathway [32, 33, 34, 35]. It remains to be determined whether these pathways are involved in the GAS6-mediated effects observed in beta cells. Human islets used in this study were unresponsive to GAS6. Whether beta cells from newborn/young humans are responsive to GAS6 remains to be investigated. An interesting question to address is where GAS6 that reaches the beta cells could originate from in vivo. Since GAS6 is present in the plasma  it could originate from the systemic circulation. However, both pancreatic alpha cells and stellate cells synthesise and secrete GAS6 [20, 23]. Thus, GAS6 secreted from these cell types could impinge on the beta cells. In conclusion, we report a role for GAS6 in the regulation of function and proliferation of neonatal rat beta cells. Understanding the molecular mechanisms behind the expansion of the perinatal beta cell mass could lead to new treatment strategies for metabolic diseases such as type 2 diabetes mellitus. In addition, it may contribute to the development of in vitro-generated beta cells that could be used for transplantation. We are very grateful for the skilled technical assistance of H. Fjordvang, J. Tybjerg and L. Grønne Pedersen (Department of Biomedical Sciences, University of Copenhagen). Human islets were provided through the JDRF award 31-2008-413 (ECIT Islet for Basic Research programme to San Raffaele Diabetes Research Institute, Milan, Italy). These studies were supported by the Danish Research Council for Medical Sciences, The EU Sixth Framework programme ‘Beta Cell Therapy’, The Novo Nordisk Foundation and The Danish Council for Strategic Research (Grant no 09-067124 to Centre for Fetal Programming). TNH, MR, LWG, NB and JHN conceived and designed the study. MR performed the LP study and MR and LWG the microarray study. TNH, MR and LWG carried out the qPCR for the LP study, and TNH the quantifications of the endocrine pancreas. TNH performed all in vitro experiments with neonatal and human islets. TNH, CAMJ and CKP designed and performed the in vitro studies using adult rat islets. TNH drafted the manuscript and all authors contributed to analysis and interpretation of the data as well as critical revision of the manuscript. All authors approved the final version of the manuscript.